Bodaboda Baby: Just call me No. 3, or Stud. 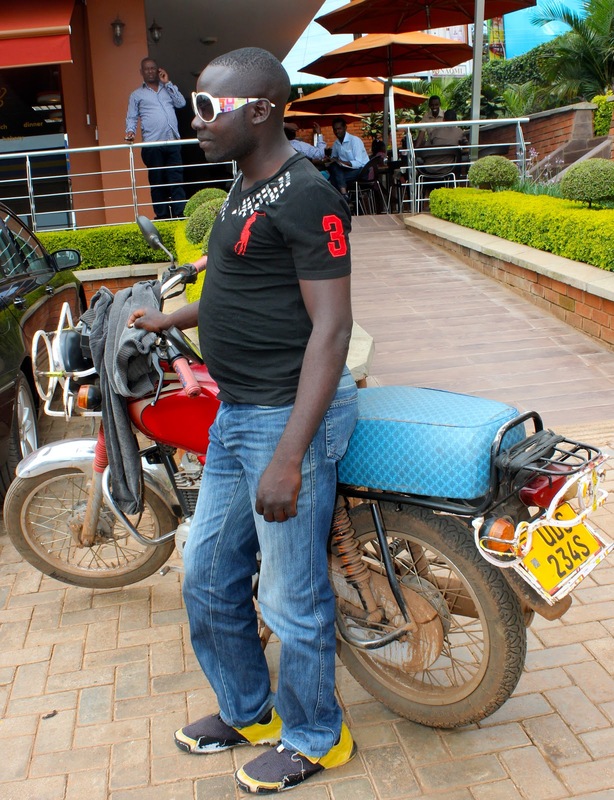 Meet Patrick, a Kireka Road boda. Just call me No. 3, or Stud. 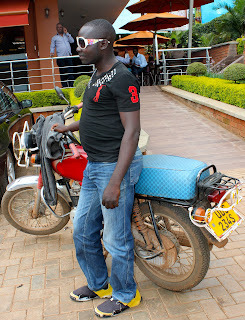 Meet Patrick, a Kireka Road boda. What makes this look is the sunnies and the plain top with the studs around the collar. I don't really like driving the boda but I don't have any other work to do. 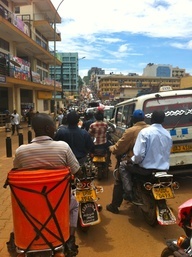 I've been driving the boda for three years. I don't have a choice. If I did I would like to be driving a car. 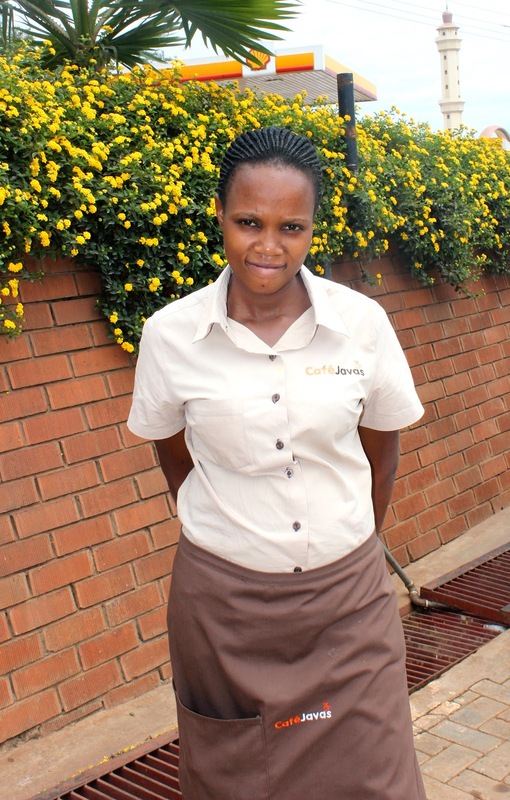 Before I became a driver I was studying in Hoima, in the village. I take my baby boy Nolan, nearly one, and my wife on the boda, especially when we're going to church on Sunday. I've been married two years. Yours truly goes for a spin with Patrick. I'm wearing a heavy jacket today (despite it being 25 degrees outside) because when I'm driving I'm moving, so it's always cold. I buy the clothes from Owino. I try to be smart but the roads are full of dust and mud. When I come from home in the morning I'm clean but I often end up dirty. I drive Ugandans and mzungus (foreigners). But I don't have regular passengers. I just pick up whoever comes to my stage on Kireka Road. I had an accident with a car in January and 2011 and ended up in the hospital and had to have treatment. But I think boda bodas should be in Uganda because they help a lot of people, especially when someone is in a rush. He (or she) can leave his car and take a boda. Just call me Mambo Number 3 - or Stud. 1960s style sunnies 10,000 UGX from Owino. Trying my new driver's sunnies on for size. They suit him better! Jeans 25,000 UGX from Owino. When you're on the road as much as this boy is you need practical shoes. The "Street of Death", not far from where I picked up Patrick. Thanks to lovely Brenda from Cafe Javas Mengo who helped with translation and photos. She said she uses bodas because she "has a lot of work to do and am always in a rush". In boda other news, the BBC currently have on their website this great pic of a Maasai man driving a boda near Eremit, about 80 km southwest of Nairobi. Coincidentally, my previous post was about a Maasai boda driver I met last week in the Kenyan capital. Thanks to my friend Silver for also spotting this story in the Daily Monitor for me, while I was away. Bodas of Rwanda, be prepared, I'm coming soon!